Westfield Southlake Shopping Center located at 2109 Southlake Mall in Merrillvill, IN will celebrate the grand opening of Cooper’s Hawk Winery & Restaurant on August 13, 2012. Significant in-center improvements also have taken place, culminating with the Cooper’s Hawk Grand Opening, in an effort to better serve the growing needs and desires of the area. As the community has continued to grow and flourish with shoppers from the Northwest Indiana area, Westfield Southlake has responded to its demands and in addition to Cooper’s Hawk Winery & Restaurant has opened 17 new stores and added new amenities. Shoppers will now enjoy upgraded seating, modern dining court areas and improved landscaping. The impressive list of new stores added to the roster include national brands such as Coach, Tevana, The Limited, and Skechers, Charming Charlie and locally known offerings including Albert’s Jewelers and AKIRA. 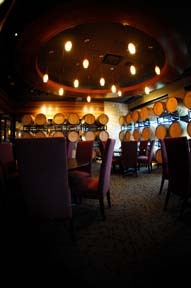 Cooper’s Hawk is the first and only combined restaurant and winery in the Midwest and was named “Hot Concept 2010” Winner by Nation’s Restaurant News. retail shop, is also a full-service restaurant serving a menu of delicious contemporary American cuisine. All of the dishes are paired with a wine, labeled on the menu by bin number, as suggested by the winemaker. Wines range from $13 to $39 a bottle and are also served by the glass. Entrées include chicken, seafood, pasta, pork and beef specialties, lighter options include a wide range of appetizers, salads and soups, specialty entrees and sandwiches. Cooper’s Hawk Winery & Restaurant also has a Wine of the Month Club. Members receive a bottle of a Cooper’s Hawk new release wine each month, exclusive to Wine Club Members. The Cooper’s Hawk gift shop offers an assortment of gift baskets and wine-related accessories, many of which are also available for purchase online at www.chwinery.com.